All plant descriptions including but not limited to sizes, colours, flowering times, hardiness and all growing, propagation guides are based on our experience of the plants in our garden. Every garden is different so we can't guarantee that your experience will be the same as ours although we do hope that our experience is useful to you. Use of this website is on the understanding that we offer to share our honest experience of the plants with you but we really can't tell if the plants will grow exactly the same in your garden. Its best to treat all plants as toxic and irritant. We always wear gloves and wash our hands after handling plants. Cookies are something to dip into your tea and absolutely nothing to do with this website (although we do like a nice Ginger Nut with our morning coffee). We sometimes link to other websites which we are not responsible for - we cannot take any responsibility for the safety and suitability of these websites. We do not link when requested - all links are ones we use ourselves. We do not host any links of the following natures: reciprocal, advertising, games, social media, charitable (unless we support the charity) and all email requests for such links are deleted without response. All photographs, text, articles, drawings and descriptions are copyright and may not be used without our written consent. We do not allow nor tolerate the commercial use of our intellectual property without permission. Taking photos and writing descriptions takes time, skill and expensive equipment and software. All photos on this website are our own. This policy includes hotlinks to our site without permission. Hotlink targets will be replaced by the image on the right - you steal our bandwidth so we advertise on your site. Personal and Private Study: Provided our intellectual property is not further published then you may of course use it for personal and private study. Academic Study: Our intellectual property may be used purely for academic study and work. 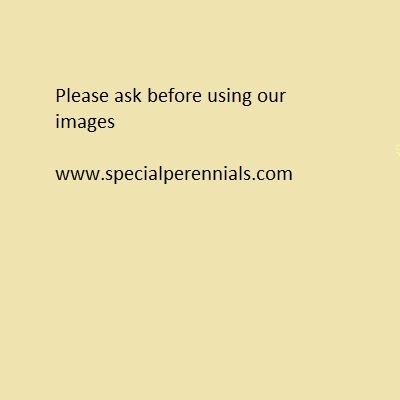 Please credit us fully and correctly referencing the website page and SpecialPerennials.com. We would appreciate it if you would inform us if your work is published. Commercial Usage: Unauthorised usage of our intellectual property by commercial entities of any kind is strictly forbidden. We may grant a license to use our materials and we will quote you a charge upon enquiry. We always take action to stop unauthorised use and we will seek maximum damages where this occurs. A retrospective license charge per photo per year or part year will also apply. Where we find hot links to our photo the image will be replaced with the image above right - hot linking not only steals our intellectual property but also our website bandwidth. We have raised a lot of money for various charities by pursuing unauthorised usage of our photos.